Custom in-ground pool & patio in Brick, NJ. Y.E.S. 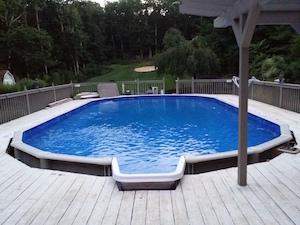 Contractors is your trusted contractor for quality pool services in the Wall Township, NJ area. We offer a full range of pool service, repairs, and maintenance options for both in-ground and above-ground pools. We also provide pool installation and excavation services and can handle all your landscape and hardscape needs. We are a fully licensed company with the knowledge and experience to handle all your pool service needs while providing you personalized service. For questions or to request an estimate, call us at 1-844-631-5953 or click below. Looking to install an in-ground or above-ground swimming pool? We can handle the installation from start to finish. We make it easy to get your pool ready for summer and close it up for the off-season. From liner replacement to plumbing to electrical, we can handle all your pool repair needs. Pool maintenance is critical to the longevity of your pool. We offer weekly and bi-weekly maintenance packages to help you prolong the life of your investment. Trees, plants, ponds, waterfalls, retaining walls, patios and more - we can design and create your ideal outdoor living space. Take the worry out of pool safety and maintenance during the off-season with a durable safety cover and professional installation. Pentair has revolutionized the pool industry with innovative and high-performance pool solutions. Each product is expertly engineered and crafted with pool and spa owners in mind, and adheres to strict standards for quality performance and design. Save energy costs with eco-friendly pumps, heaters and LED lighting technology. Create the perfect ambiance with color-changing lights and water features. Make maintaining your pool simple and worry-free with easy-to-use chlorine generators, automatic cleaners and fully-automated control systems. We are the local authorized installer of Pentair aquatic systems. Need help choosing the right product for your pool? Let our pros help. Call us to schedule a consultation and estimate today. Radiant Pools manufactures state-of-the-art, energy-efficient insulated pools that are strong enough to be installed above ground, in ground, and semi in ground. Radiant Pools offer greater structural integrity, limitless installation options, incredible warranty protection and energy savings. Every Radiant Pools swimming pool comes with a 100% lifetime, fully-transferable, non-prorated warranty against manufacturing defects for as long as you own your pool – and beyond! Comes with a lifetime warranty that even covers winter damage. We are the local authorized Radiant Pools installer. Contact us to schedule a consultation and estimate today. Zodiac products are the #1 choice for millions of pool owners worldwide. The expansive product line delivers the most technologically-advanced, energy-efficient, durable and reliable pool and spa products available. Get a perfectly clean pool with a complete line of innovative, ultra-efficient pool cleaners. Nature2 is an eco-friendly mineral sanitizer that delivers clean pool water that is pure, fresh, and gently soothing. Nature2 is proven to destroy bacteria and control algae without any of the harsh effects of traditional chemicals, so you get the purest, cleanest swimming experience possible without the hassle. Leaf catchers, automatic flow regulators and suction outlet covers - improve your pool experience with Zodiac's complete line of pool parts and accessories. Our team can give you the pool you've always dreamed of! Whether you have questions about one of our services or you are looking for an estimate for your project, contact Y.E.S. Contractors today and let our professionals help.